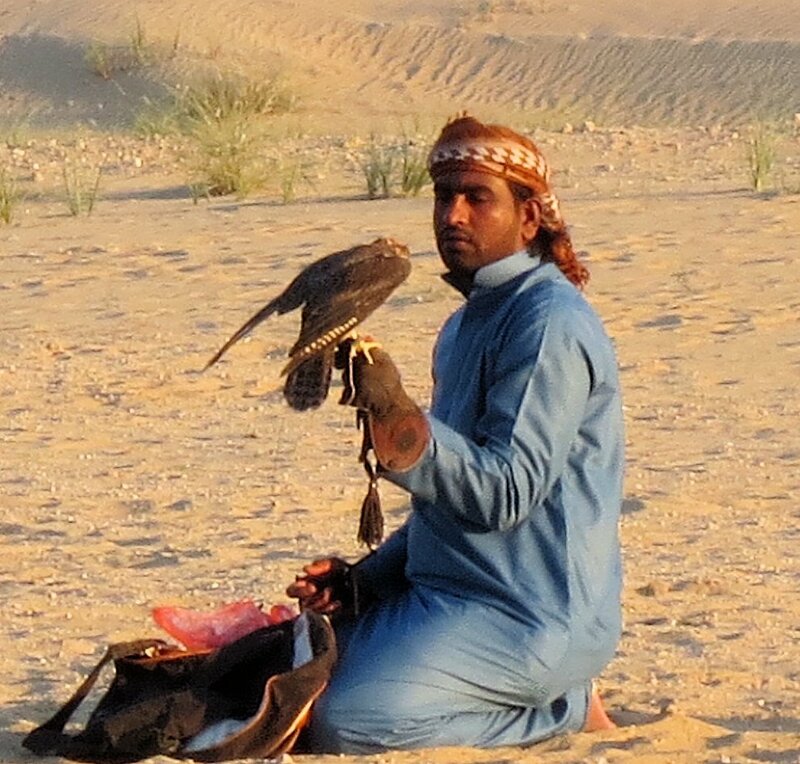 Birds of prey are some pretty awesome creatures, and I’m kind of obsessed with them. OK, not obsessed, but I think they’re pretty dang badass, you know? 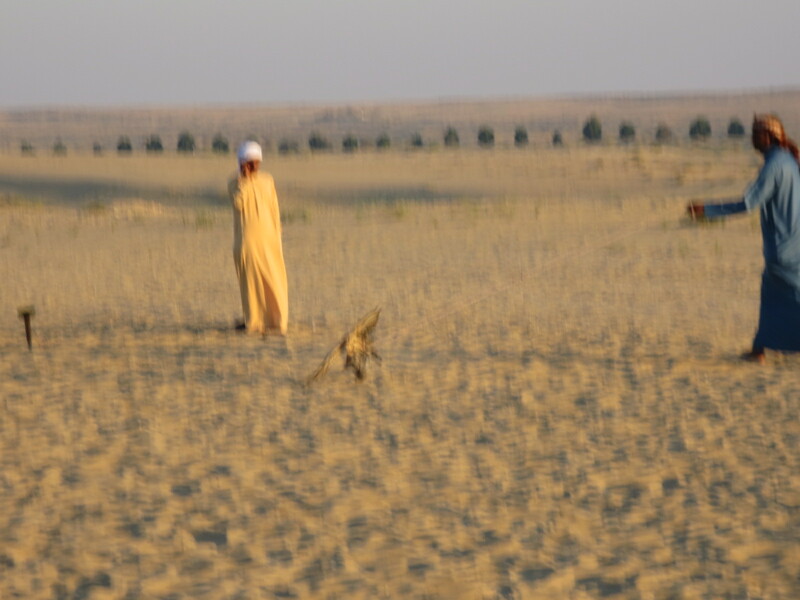 They one of nature’s most efficient hunters and I’m always amazed to see them in action. Now, I don’t know about you, but my opportunities to see these hunters in action in the wild are really limited. TBG used to get to watch the American Bald Eagles hunt and fish over southern Alabama’s lakes and rivers. 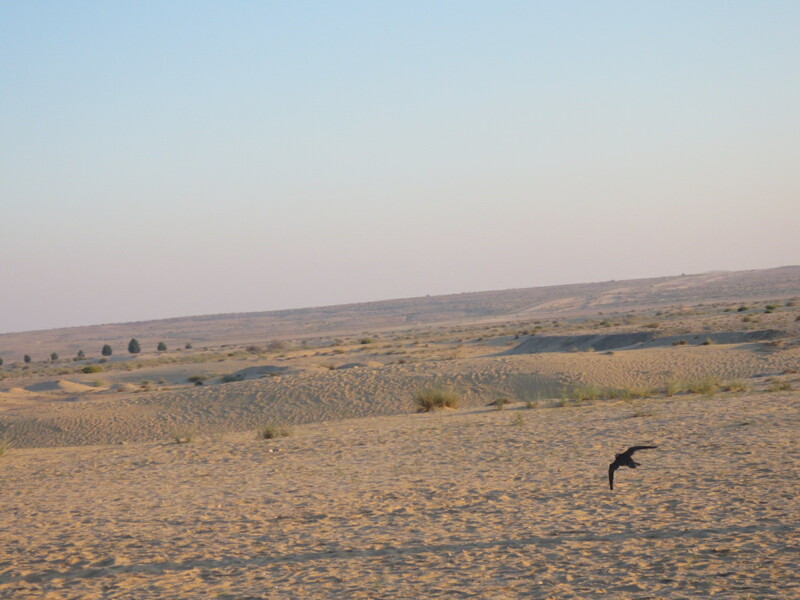 He said that he regularly flew within sight of their nests and watched them raise families. Me? I don’t fly helicopters, so my chances are limited. 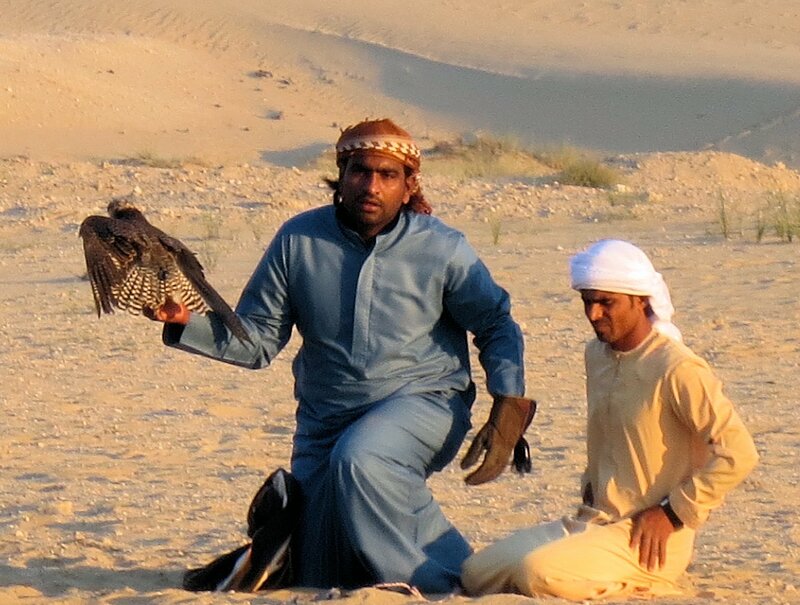 But when we stayed at the Bab Al Shams resort recently, there was a gent there that had a pair of falcons, and was providing an exhibition of their hunting abilities. 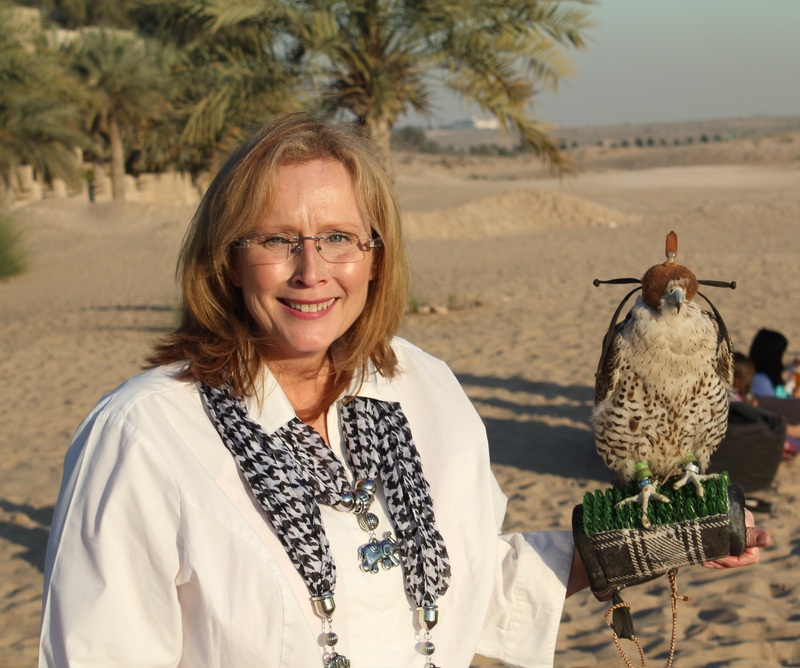 Tiny bit of really cool information about falconry and the middle east….. 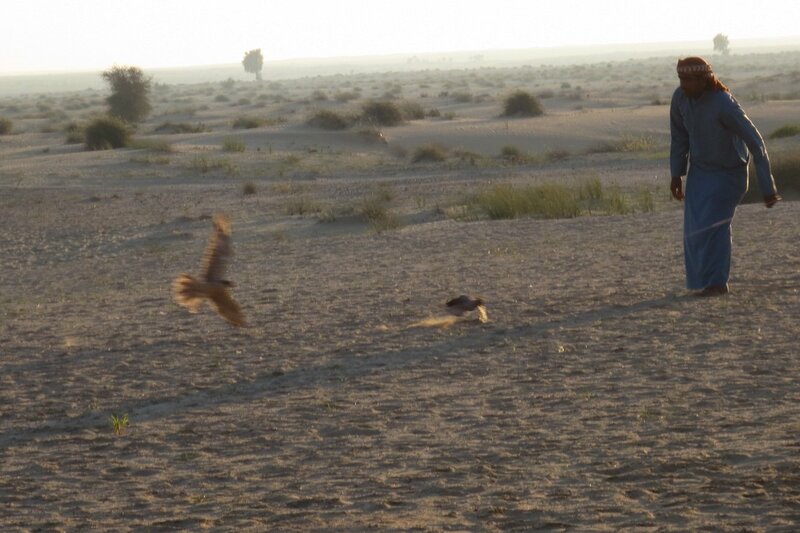 I *believe* that the falcons on display here are the Saker Falcons, common to wide open areas, and many desert areas. 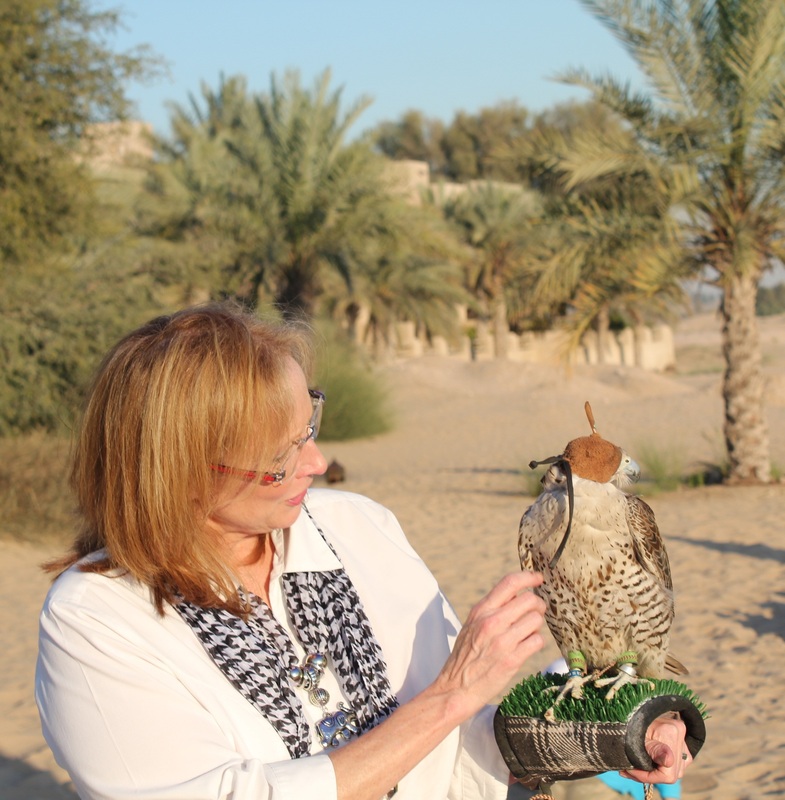 I asked a number of times and the accent of the handler was quite heavy, and my American ears were not listening well, I fear. They’re a common choice here because they adapt to the environment well and they’re apparently not afraid to tussle with their prey on the ground if needed. Yikes! 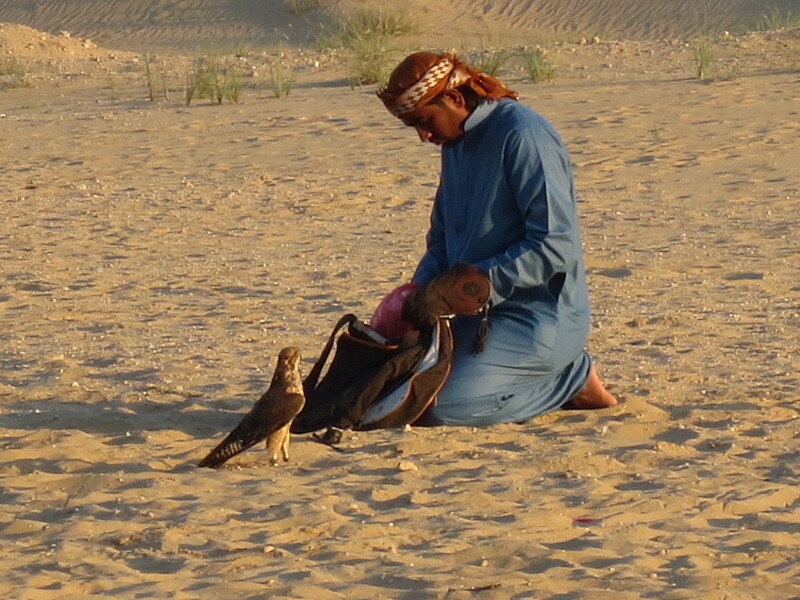 The story was told that falcons are used in the desert as a hunting tool by the herders that travel the sands. 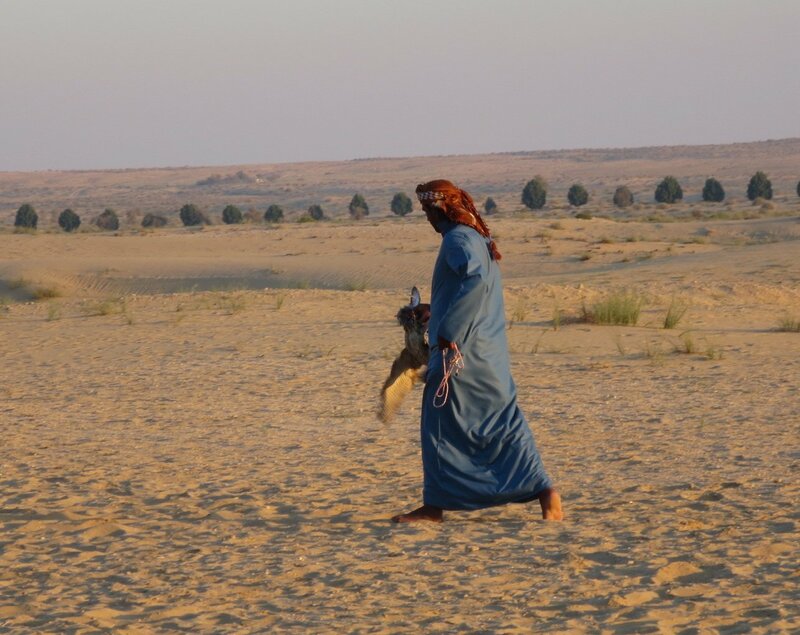 The diet of the herders would consist of camel milk and dates were it not for these hunters bringing back prey. Now, this is important, their religion requires animals to be slaughtered in a certain manner so the hunters must bring the prey back alive. Teaching them to do this must be an amazingly difficult task. 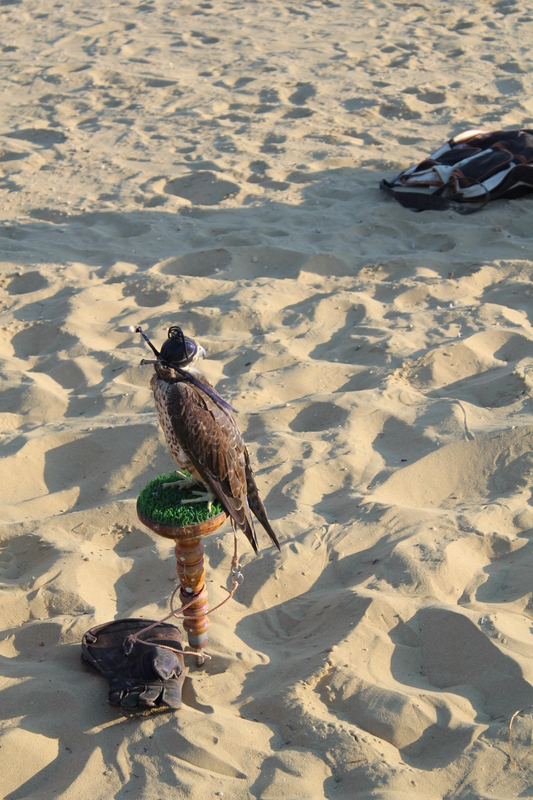 Typically, falcons are thought of as hobbies for the very rich, and in many instances, they are. 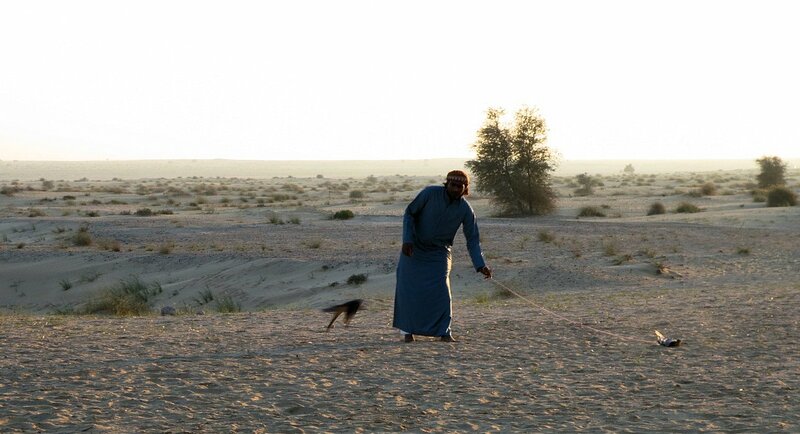 Another story told was about the Sheik’s falcon hunting and taking down a small desert deer. Doesn’t seem like a big deal until you factor in the huge size difference! 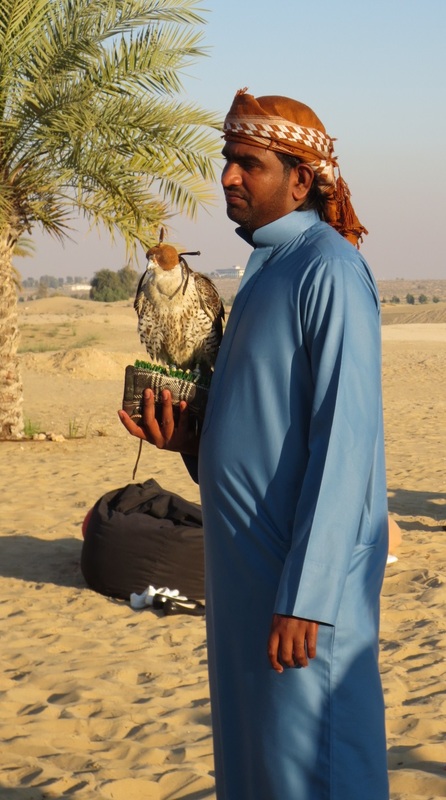 Arabian falconers use a stiff reinforced tube called a mangala on their arm to allow the birds a stable place to perch and protect the handler’s arm from the bird’s talons. These, like the leather hoods used to cover the birds’ heads to keep them calm have evolved into works of art with embroidery, beading, feathers and embossing. 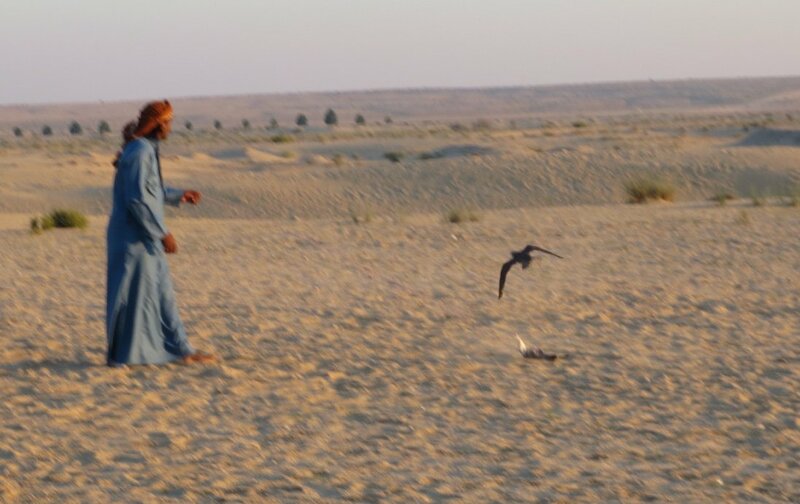 These are photos of the handler swinging a dead pigeon around in a huge circle in order to train the bird, teaching it to take down and return the prey. The photos are sort of blurry in places, but understand that it was all happening REALLY fast! 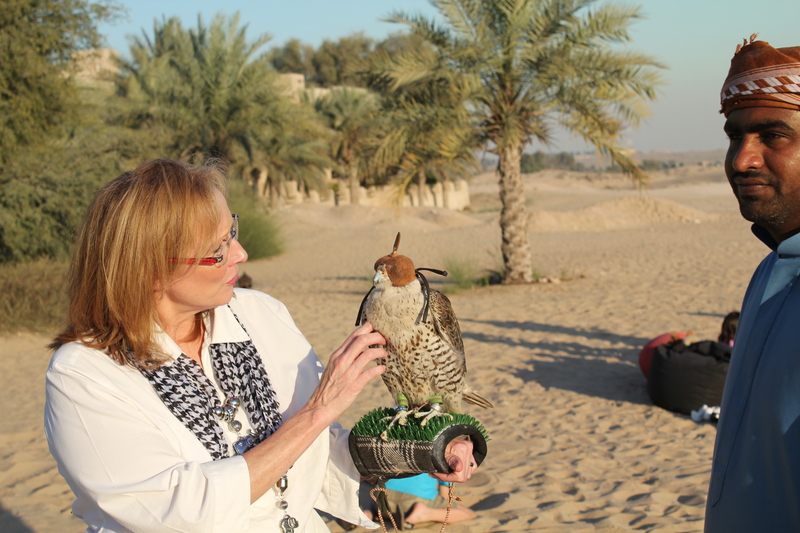 When this bird actually sat on my arm, for some reason I began talking to it in a low soothing voice. 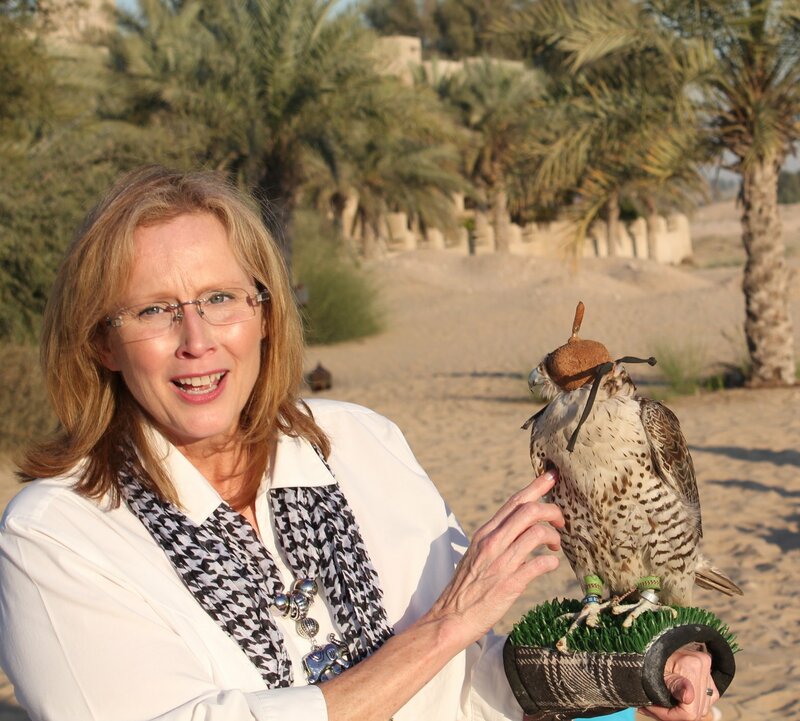 TBG was taking photos, and the bird allowed me to pet it and to ruffle its feathers to see how they felt from the underside – much softer than from the top side! 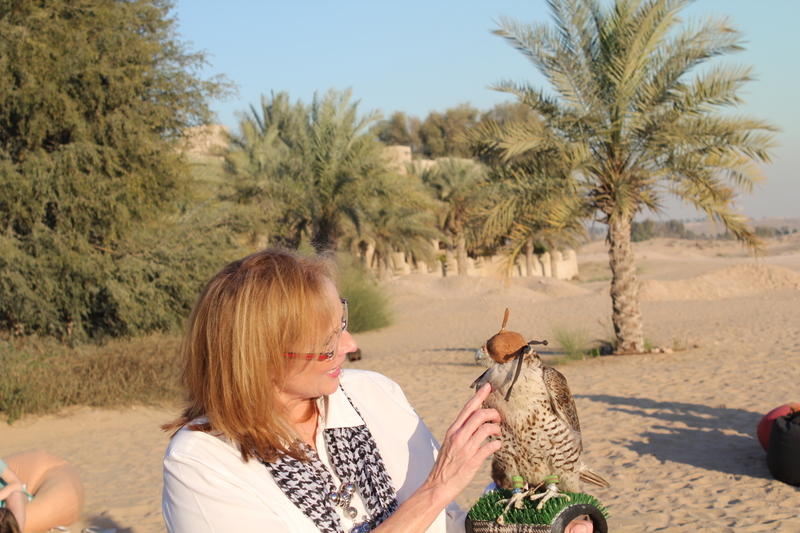 The bird’s handler said “he likes your voice, he turns his head towards you and leans in” – at least I *think* that’s what he said…. 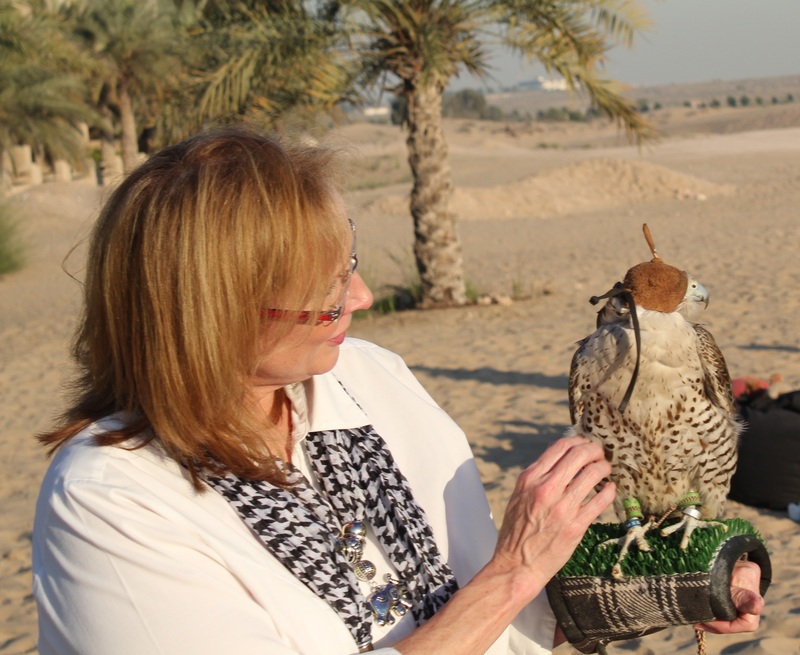 TBG wanted to hold the falcon as well – and he wasn’t the least bit nervous about it – acted just like he’d been doing it all his life. 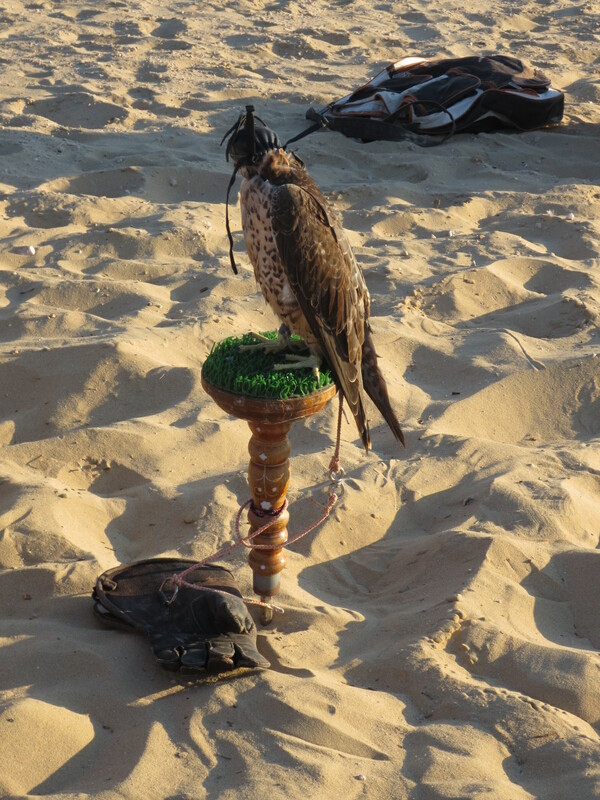 Well, he flies for a living, so I suppose it’s not such a big deal to him…. But to me? I was touching the wing of one that flies, and it was pretty dang cool. 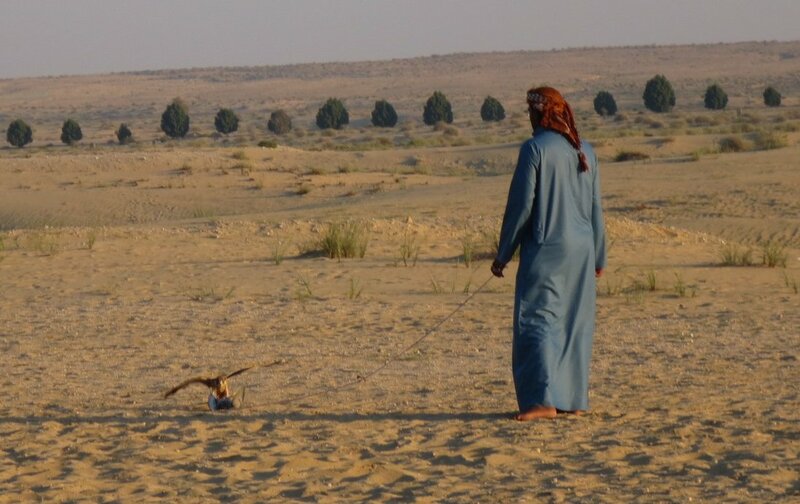 Someone who lived in the Middle East for awhile told me about this too, wish I could experience it for myself one day! 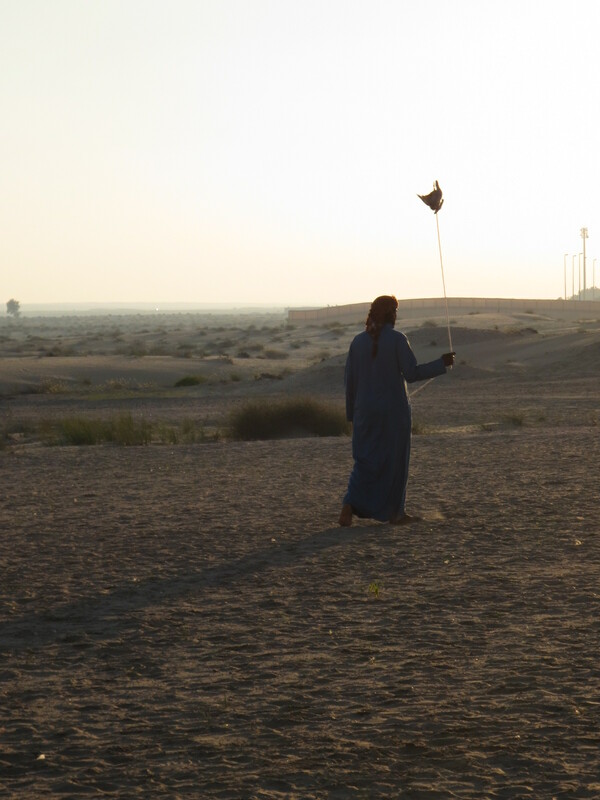 Pinkpostcards, it truly was a wonderful experience – I never imagined I would have the opportunity, that’s for sure. 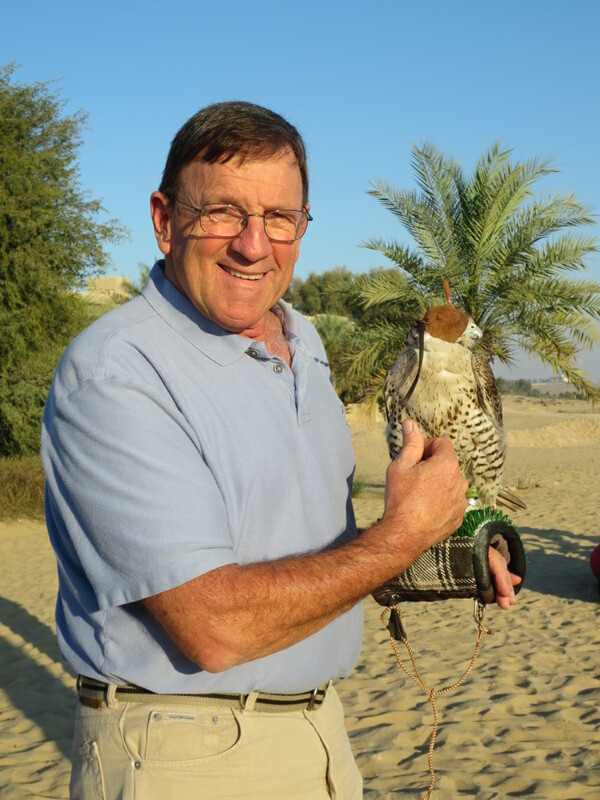 I only know one single person that owns and works a bird of prey. 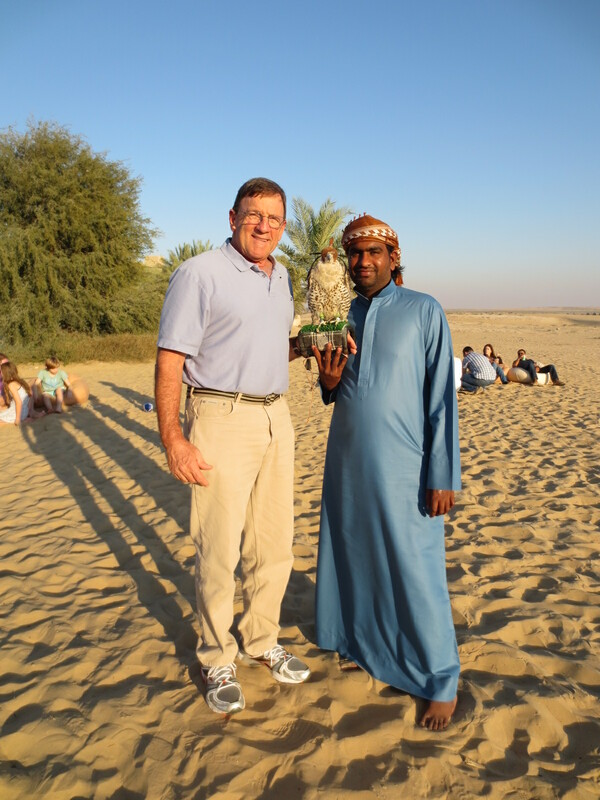 Thanks for following along – this is an awesome journey for me! You’re welcome 🙂 travelling the world and experiencing different cultures is what drives me, glad that there are so many others out there like that too. Keeping posting! How flipping Amazing was that! I’m so happy that you are getting to experience all these fabulous things and that you are sharing them with us! Fantastic pics too btw! Wow… that was amazing! You hit two of my passions. Birds, and Flowers! 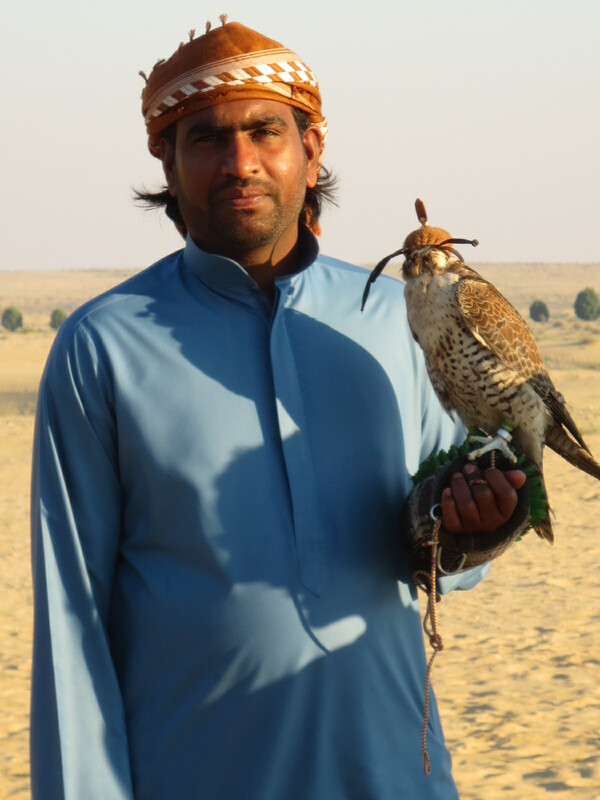 I’m jealous of the falcon’s handler. Those animals are just lovely, and strong. I know from having birds most of my life, that they “can” hurt you with those beaks and they choose not to. There’s a lot of thinking going on in those little heads. You look lovely girlfriend. Keep up the good work!